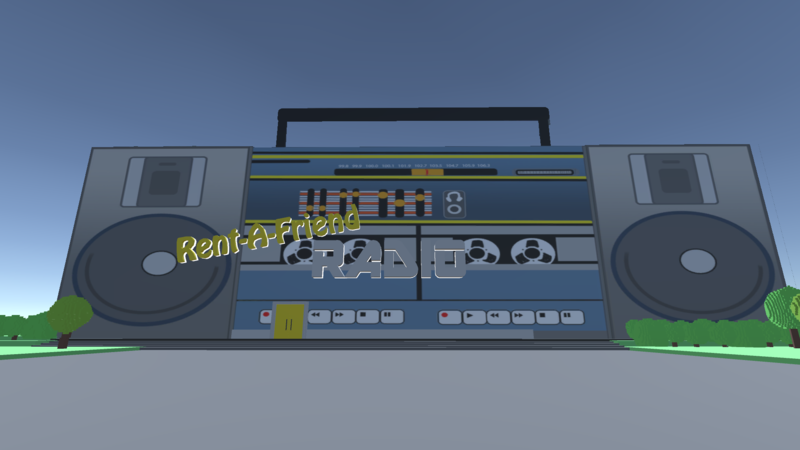 ← Rent-A-Friend Radio is now a GAME! Explore the Rent-A-Friend Studio grounds! It’s mainly a bunch of low poly trees right now. But we’re open to suggestion. What would you like? A park bench or something? Some squirrels or bunnies? Let us know. Begin your tour of the Rent-A-Friend Radio Studio with the receptionist. Until we can hire one, it’s Rent-A-Friend 2000. He does most of the work around here. After you’ve had a chance to walk around and see the place, Send us an email with your ideas or artwork. We need decorations. You’ll see. We just moved into the place and are still trying to make it look like home. Have your kids draw us a picture we can put on the bulletin board. Also, we will have a room just for replying to fan mail, so send us questions we can answer! and thanks for being a part of Rent-A-Friend Radio!